As the semester has progressed, I’ve found, each week, that my sense of what interests and excites me about the current DH landscape is becoming richer, honed, and focused. Even as I marvel at, and have great respect and admiration for the large scale digital analysis that’s going on in the realm of social media scraping , and big data crunching, I keep finding my way back toward the idea of “distortion” and de-formance as a research method and outcome in DH. Jotting down notes that might help me find my way toward a generative approach to DH scholarship, I’ve pulled a surprising combination of books from my shelf for inspiration: John Berger’s And Our Faces, My Heart, Brief as Photographs, In Praise of Shadows by Junichiro Tanizaki, Joseph Cambell’s The Inner Reaches of Outerspace, and On Weathering: The Life of Buidlings in Time by Mohsen Mostafavi to name a few. My instincts keep drifting toward the aesthetic, and remembering a point Matt made in class about some DH practitioners creating imperfect 3D-printed objects as teaching tools, I scoured the internet for DH studies in Materiality. In mulling over the DH landscape gradually examined in our readings and class discussions, I’ve found, in a way, that I’ve been chasing myself. In a course focused less on subject matter, and more on methodology and approach, I’m forced to burrow down into what really motivates me in my learning. This week, I was blown away by the work that Kevin is doing with ImageJ. I’m excited to the point of jumping the gun on this blog post when I think about the potential projects that might come about when building and theorizing around the ImageJ software. Today, I downloaded the ImageJ package for Mac OS X Java App. I’ll begin experimenting with it in the coming weeks. For my initial data project, I would like to analyze a bundle of still frame from a film by Andrey Tarkovsky (The Mirror, or The Sacrifice, or potentially, Stalker). 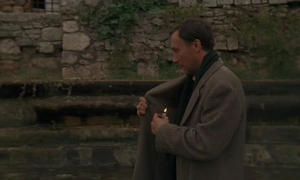 Alternatively, and somewhat thematically as the flame of time indicates in the epigraph to this blog post, I would love to analyze the nearly 10-min sequence in Nostalghia where the film’s main protagonist walks the length of a long fountain, all the while shielding the flame of a candle he cradles inside his overcoat to prevent it from going out. I hope for this data exercise to be an entryway into a more focused thesis for a larger project. (Not necessarily of a similar vein, but definitely derivative of what I learn in the process). I’m currently reading Tarkovsky’s cinema theory monograph, Sculpting in Time. What I hope to learn from a project that analyzes an iconic, yet not widely-viewed director in this initial data project is modest. In addition to creating an outcome that can visualize the “sculpting” in time of Tarkovsky’s films, I hope to get a sense of his sculpting of time by utilizing the ImageJ Stacks menu. I’ve always loved Tarkovsky’s films, even though, at times, I find them difficult to watch. They’re ghostly, beautiful, and most often, mysterious. Tarkovsky’s rhythmic examinations of nature and landscape of all types and scale with slow, drawn out single shots that seem to extend far longer than their actual temporal length have always contrasted with the contentious, even dangerous political climate that existed in modern Russia during the time in which they were created. I hope to take on this small-scale project as a way to delve deeper into a subject that stimulates me. And from there, I will turn my gaze toward the DH community at large to try and locate gaps in the collective methodological toolbox, or places from which I can propose and launch a meaningful contribution on a larger scale. Next step, capture and organize a bundle of still frames. And get my feet wet using ImageJ Stacks. This entry was posted in Course Readings, Data Projects and tagged DataProject, De-Formation, ImageJ, Time on November 15, 2015 by Taylor Dietrich. New York City has an incredible amount of data available on their website for the public to explore. They have annual summary reports, as well as interactive tools where one can select variables they are interested in seeing. The instantly available data is already crunched, but one can request “raw” data with an online request form. According to the instructions, it can take anywhere from two to four weeks for the files to be sent to you. For the dataset project, I am interested in exploring the teen pregnancy rates in the five boroughs. I will start playing with the data and see what correlations stand out to me when I visualize them using various visualization tools. Perhaps I will notice something beyond the correlation between economic status and unplanned pregnancy and discover something new for me. On Wednesday, I went to the Digital Fellows office hours and talked to Patrick Smyth, Hannah Aizenman, and Stephen Zweibel about my options. They suggested I start with Excel pivot tables and then move on to Gapminder and Tableau to see what I can do there. This entry was posted in Data Projects and tagged DataProject, NYCData, NYCTeens on November 10, 2015 by Anastasiya.